[Register an account at Gladriel] < Register today and get 1 Diamond and 500 Gold. Do not forget to join Gladriel today, a gaming community where you can sell/buy games cheaply! They are currently holding raffles and you can easily win Playstation 3 or some video games. Someone has just won a PS3 today! With just 1 ticket. If you are lucky, you will win! For shipping issues, just check with your local postal company to see if they provide middle freight forwarding services. Restaurant City is having a soccer/football fiesta with all the excitement over the Fifa World Cup 2010. 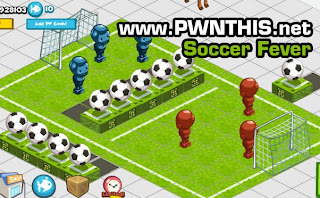 With the new items, you can easily transform your restaurant into a Soccer/Football Pitch! These are must have items for all you soccer/football fans. Footie Fever! Have fun making your own pitch. We have introduced quite a few new doors and windows this week! Whether you choose the Elegant Night Double Door, the Posh Night Double Door or the Lovely Night Door is up to you! The Trendy Clubbers won’t notice anyway, they are too eager to get inside and have a drink at the bar! Make sure you have your bouncers on duty!